Gradually, as the first act carries on, the actors slip into American accents, period dress and each performance becomes more immersed in character, as if the ensemble has genuinely been enchanted. As the Yard’s pick for its first ever revival, the Salem witch trials of The Crucible, used as allegory for the McCarthy crusade against Communism, make complete sense. The production’s use of both modern and period dress helps hammer home the point – this story is truly timeless. It could happen now. For the most part, the production allows the sheer power of Miller’s words and themes to shine through. The cosy warmth of the Proctor home, with a small fire and food on the table, is wrenched apart by the cruelty of the court, made to look like an elite nightclub with rope and bouncer-like officials, exploiting mass hysteria to make an example of anyone who doesn’t quite fit in. Some other decisions are less logical, however. The masked creatures who haunt the witch trials are undoubtedly creepy and add to the magic element, but they also detract from the strength of the story. The Crucible is a human play, about the weaknesses and flaws of human nature. As John Proctor says, while around him villagers turn on each other and lead their neighbours to death, ‘we are only what we always were, but naked.’ Injecting a genuine supernatural element to this is a distraction. The decision to gender swap some of the casting is almost immaterial, although certainly not incongruous. 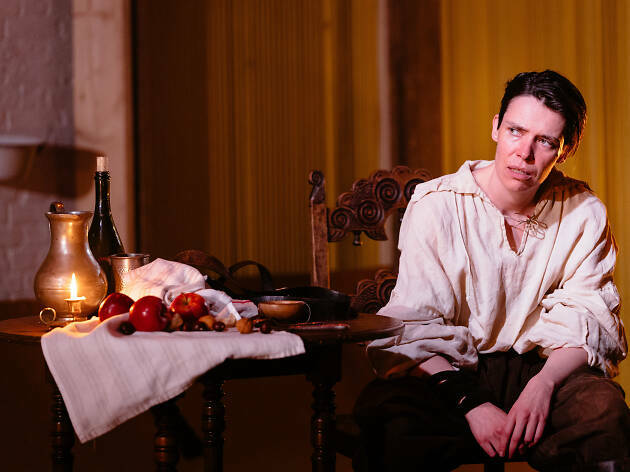 As possibly the first woman to be cast in the role of John Proctor, Caoilfhionn Dunne’s performance grows as the play goes on, adding depth and subtlety until the final, charged moments when she is truly captivating in her representation of Proctor’s crumbling, flawed heroism. Emma D’arcy as Elizabeth Proctor brings truly touching emotional vulnerability, and Sophie Duval in various roles practically shapeshifts to switch adeptly between characters. Despite a three-hour running time, the production is pacy and tense enough to be completely enthralling. Thanks to the power of the play itself, some interesting creative decisions and brilliant performances, as a whole the show is utterly bewitching. The Crucible runs through 11 May.